Higher battery capacity is something we are seeing from many of the manufacturers and if you are not making these offerings, you could be falling behind. But to Ridgid it is not just about more Ah, their batteries also include other features that make the batteries even better. Inside each battery is some high-tech circuitry that offers protection against shorting, current over-drawing, cell over-discharge, and provide cell balancing. You can also use the new Ridgid Advanced Lithium batteries in greater temperature ranges from 29F up to 158F, and your battery will automatically take safety precautions if the limits are reached to prevent damage. 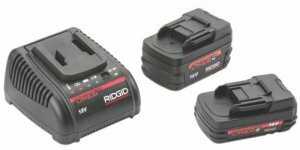 The 2.0Ah battery will now be the standard offering in Ridgid Cordless Press Tool Kits and is said to deliver more than 200 presses per charge, while an upgraded 4.0Ah can deliver more than 400 PPC. Charge times on the new batteries is actually pretty good at 30 minutes for 2.0 and 45 min. for 4.0Ah. So when can you get these new batteries for your orange Home Depot cordless tools? Well unfortunately you can't. These batteries are actually for Ridgid's line of plumbing tools, though I am sure the orange tools will gets theirs soon enough.